the world’s only magneto-encephlographic (MEG) imaging unit designed for use with cochlear implant patients. Using the 3D environment simulator, studies are investigating the relationship between cognition and complex listening situations. These studies are trying to measure how much ‘difficulty’ people, particularly the elderly, experience with different degrees of hearing loss, and how much hearing aids/cochlear implants help to overcome these difficulties. In addition, electrophysiology and MEG imaging studies are investigating auditory processing after clinical hearing loss intervention, for example, a cochlear implant. Findings from this research will guide design of devices, sound coding and intervention therapies; these will be developed and clinically evaluated in the Intelligent Interface and Individual Solutions Research Themes. 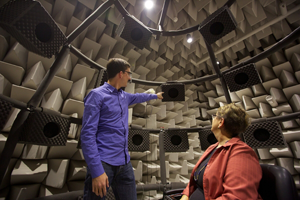 This project will explore how much difficulty does hearing disorder cause people with different degrees of loss and cognitive ability in different situations and the benefits that hearing aids provide. This project will examine how brain processes change after intervention and how beneficial changes be strengthened and accelerated.